John Deere’s innovative DirectDrive transmission was judged winner of the tractor category in the new International Machinery Manufacturers Awards (IMMA), which were presented at Cereals 2014 in June. A 6190R tractor equipped with DirectDrive was displayed on the IMMA stand throughout the event. The International Machinery Manufacturers’ Awards, the new Oscars for agricultural machinery, were launched by Cereals event organiser Haymarket Exhibitions to recognise companies that have produced machines that stand out from the crowd by delivering a mix of innovation, cost-effectiveness and value. The newly designed 24-speed DirectDrive transmission employs Formula 1 technology on John Deere’s six-cylinder 6R Series tractor range to combine the handling comfort of an infinitely variable shift transmission (IVT) with exceptional efficiency. It is designed to deliver maximum productivity with lower fuel consumption for tasks that need continuous power, such as ploughing and towing, pto work and road transport. The transmission’s dual clutch technology has become the benchmark in the luxury car industry, and is now available in a tractor for the first time, setting new standards in terms of shifting speed and operator comfort. 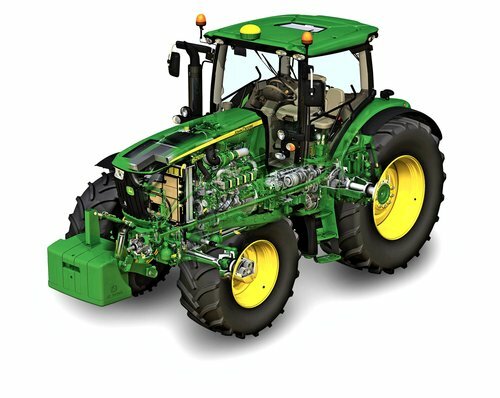 Significant fuel savings of up to four per cent, compared with currently available transmissions, have been measured on the test facilities at John Deere’s tractor factory in Mannheim and during independent field tests. The semi-automatic DirectDrive transmission system consists of eight powershift speeds in each of three ranges, which are specifically designed for typical field applications. The system enables the driver to remain in the selected range for all relevant operations, so switching between ranges is rarely necessary, and the resulting minimal interruption to the power flow adds to the overall efficiency of the tractor’s power train. The driver can choose between a manual mode to take command of forward and reverse speed changes via the tractor control lever, or an automatic mode. In this mode, the transmission enables fast changes between the eight speeds under full load, and also provides fully automatic changes between the A, B and C ranges. Depending on the actual load the Efficiency Manager function, also enabled in Auto mode, automatically matches the appropriate speed and engine rpm for maximum fuel efficiency. The tractor’s 40 or 50kph (in Eco mode) top speeds are also achieved with significantly reduced engine rpm. As a result, the new DirectDrive transmission offers a cost-effective alternative to existing IVTs. DirectDrive is optionally available on the latest John Deere 6R Series tractors from the 140hp 6140R to the top of the range 210hp 6210R.